Bigger, bolder brows are definitely here to stay. There are so many products on the market right now that are designed to help you fake that fuller brow that people are often spoilt for choice but as a girl with naturally fuller, and rather dark, eyebrows I've really struggled to find the perfect products for me. When all you need to do is to fill in a few gaps, neaten up an arch and somehow manage to get your brows to stay in one place you'll soon discover that a lot of products end up being way too intense and those naturally full brows end up looking quite ridiculous and rather harsh. I'm aware that I'm rather blessed to have an abundance of eyebrow hair, believe me I know how screwed I would be if I had to somehow draw on matching eyebrows, but when a look calls for a delicate, soft brow it can become so frustrating when it's almost impossible to achieve. One of my biggest brow issues (but ironically it's also one of the things I love the most) is the colour of my eyebrows. They're almost black and on my very pale skin it creates quite a stark contrast. With a little bit of bronzer it can look great but because of their deep pigment I'm not looking for any intensely pigmented products. Brow products that can be slowly built up to increase pigmentation or products that can add just a hint of colour are my best friends. Finding gaps in my brows has to be the most frustrating problem I face. Having to fill in my brows with such dark brown shades requires a very light hand and it's so easy to end up creating a block of colour that doesn't mimic a natural hair at all. The three products I'm featuring today are brilliant for people with naturally fuller brows for the many reasons that I'm about to list below but they're also excellent brow products in their own right. I think anyone would enjoy using them, even if you have quite sparse brows, if you're looking for products that excel in precision and leave a natural looking finish. 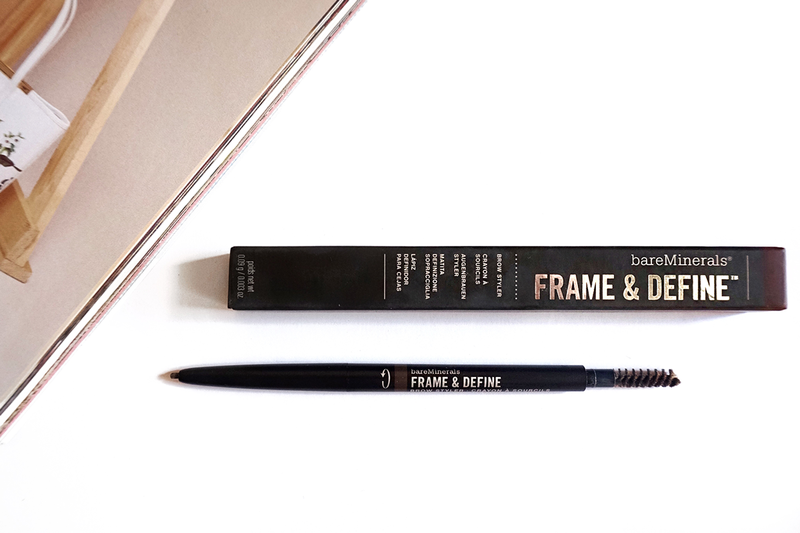 My favourite product for precision and defining my arch is bareMinerals's Frame and Define Brow Styler. * At £14, it's a little bit cheaper than Anastasia's famous Brow Wiz (which I'm desperate to try to see how to two compare - I don't know if I can love a product more than Frame and Define but we'll have to see), and it comes in two shades: Universal Light and Universal Dark. The shade range is probably the only issue I have with the product. Universal Dark luckily suits my brows perfectly but I can imagine that a few people might struggle to find a perfect match out of the 2 available. With a handy brow brush on one end, I comb through my brows and brush them into place and then twist up the product just a little bit on the other end. The nib is so tiny that it's absolutely perfect for defining my arch and it glides on so smoothly with no tugging which helps to create precise, natural looking lines. I tend to use this with a really light hand but you can also apply a lot more pressure to achieve a bolder look. I've always struggled with filling in the front of my brows but applying this lightly really helps me achieve the shape I desire. The formulation of the brow product is lovely too. It's soft enough that it glides across the brow smoothly and stays put all day without fading but it's not too creamy that you accidentally deposit too much product and get dark clumps in your brow. 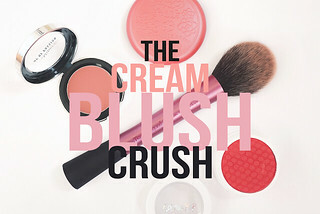 It looks natural, it is super easy to use and it lasts all day! My eyebrow gel of choice is L'Oreal's Brow Artist Plumper which I featured here in April. I've found a lot of brow gel formulations to either be too thick or I've found that they dry down quite hard and tend to flake off after a few hours of wear. The consistency of the Brow Artist Plumper is lightweight whilst still being quite pigmented and it doesn't start clumping up if you go back over an area. It dries down and definitely keeps my pesky longer brow hairs in place but I find that my brows aren't completely rigid and they still feel quite soft. Another issue I often have with brow gels is that the wands often deposit way too much product onto the brow. The tiny little wand from L'Oreal's Brow Artist Plumper allows me to get to hard to reach places and it picks up just the right amount of product. For £5.99 it's a wonderful product and I either wear this over bareMinerals's Frame and Define Brow Styler or for softer brow days I just wear this on its own. Everyone needs an eyeshadow that matches their brow colour perfectly. When I want to achieve a softer, less defined brow look I always reach for Too Faced's Sexpresso eyeshadow which I first discovered in the Natural Eyes Palette way back when I was 16. 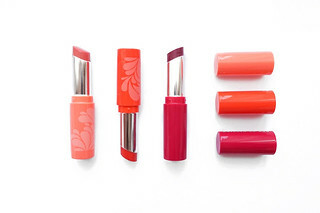 I have a little duo with Sexpresso in that I like to pop in my makeup bag. I adore the texture and longevity of Too Faced's shadows and I love using this to create a softer edge or to lightly fill in any sparse areas. To apply the shadow I like to use a small angled brush from Sigma which I believe is now called the E65 (previously SS266). It's nice and thin so it deposits the shadow exactly where I want it without leaving unwanted product everywhere and I really love the quality of Sigma brushes. I've literally had this one for 5 or 6 years and it's still in amazing condition! My other eyebrow tool of choice has to be my Tweezerman Mini Slant Tweezers which always manage to grab every little hair. So that's it! My Top 3 products to fill in naturally fuller brows. They all work wonderfully together or alone depending on the look I'm going for. Make sure you leave a comment below telling me what your biggest brow issue is and let me know what your favourite brow products are too! 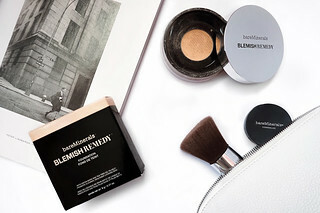 * This post contains a PR Sample sent from bareMinerals. But if you know me by now, the ridiculous amount of love I have for the brand is entirely my own.